I want to take this opportunity to thank you for allowing me to serve our health care system as the Chairman of the Board of Trustees this Imperial Year. We have worked diligently and made great progress, including opening two new replacement facilities as outpatient medical centers and expanding our telehealth program. Also, through our efforts in patient acquisition in 2016, we reversed the industry trend and experienced an increase in our inpatient population. As a result we saw an increase in both inpatient and outpatient activity for our system. So far this year, our year over year results continue to show that our inpatient population is growing. Throughout the year, we have worked hard to ensure that each of our 22 locations is functioning as efficiently and effectively as possible, and able to provide the best care possible to the patients and families it provides cares for. We also want to be sure we are meeting the needs of the communities we serve and have added different programs, such as rehabilitation, fracture clinics, wellness and specialized physical fitness efforts, as appropriate. While we only have 22 locations in North America, we have a concern for all children in need, and that is why we routinely hold outreach clinics at 120 locations, including several in countries without a Shriners Hospital, and why our hospitals are partnering with local health care providers to expand their outreach. We are also seeking ways to collaborate with our staff’s volunteer efforts with other international humanitarian organizations, and improving our ability to respond to emergencies wherever and whenever they occur. To help us provide care to our patients in an efficient, considerate manner, we are also expanding our telehealth care program. This initiative allows patients to be seen at affiliate local locations, and uses video-conferencing to connect the patients with their Shriners Hospitals’ medical team. This effort reduces both the amount of time away from home and travel time. In 2017, we celebrated the dedications of new facilities in Lexington, Kentucky, and Pasadena, California. The new 75,000-square-foot, three-story, state-of-the-art medical center in Pasadena will offer treatment for a full range of pediatric orthopaedic conditions, cleft lip and palate, and reconstructive and plastic surgeries, with inpatient care performed at nearby Huntington Memorial Hospital. The two hospitals will work together in a shared services partnership, which will greatly benefit the children in this region. The new center is expected to open later this summer. The new Shriners Hospitals for Children Medical Center in Lexington, Kentucky, opened in April and was dedicated in May 2017. The new facility, located on the University of Kentucky HealthCare campus, is a state-of-the-art ambulatory care center, designed to better meet the orthopaedic needs of area children and their families well into the future. These are the second and third hospitals in our system to be converted to outpatient care centers, which more appropriately fits their particular location and patient base. The members of the Joint Boards of Directors and Trustees are determined to ensure that our health care system will continue to provide our patients with the best care possible, which means our staff needs to be up to date on the latest medical knowledge, techniques and procedures. Toward that end, in 2016, the board members authorized additional tuition reimbursement programs for staff members. We are also taking steps that will allow more hospitals to achieve nursing excellence and magnet status. Using programs of the Governance Institute, we are also working to improve the procedures and processes of our leadership at both the national and local levels. Educating and strengthening both our staff and our leadership ultimately will improve the quality and effectiveness of patient care, which is always our overall goal. Through research, Shriners Hospitals for Children has made major contributions to the worldwide body of medical knowledge. The research program receives more than 185 grant, fellowship, and internship applications annually. In 2016, 16 Lemieux medical student internships, 29 fellowships, and 91 research projects were funded. This year, our St. Louis hospital opened a new 6,000 square foot laboratory with state-of-the-art equipment dedicated to pediatric musculoskeletal research. The team is investigating a number of areas, including preventing and treating arthritis in children, and developing new therapies based on the concept of “regenerative medicine,” that is, using living cells to regenerate cartilage and bone that has been damaged by arthritis of the joints. In many ways, it is the support and generosity of our donors that makes it possible for Shriners Hospitals for Children to be a leader in pediatric specialty care. Our donors help support every initiative and program of our health care system. In 2016, our donor relations staff exceeded their fundraising goal of $298 million by more than $10 million, raising $308,344,000, including revenue from estate gifts. Shriners Hospitals has again been recognized with a 4-star Charity Navigator rating for our strong financial health and commitment to accountability and transparency. The rating recognizes that our organization surpasses industry standards and outperforms most charities, which gives our donors confidence and security. This is a significant, and highly beneficial, achievement for our donor relations staff, and our health care system. While we can certainly celebrate many successes, and have many reasons to be proud of the amazing work of Shriners Hospitals for Children, we need to be aware that we also face many challenges. Chief among these are the need to increase patient volumes, and to balance the budget within a reasonable time frame. We need to continue to reduce the budget deficit, contain costs, increase efficiency, strengthen donor programs and improve our third-party pay processes. We are confident we can meet and address these challenges, especially if everyone works together to make our health care system the best it can be. Every year the people of Shriners Hospitals for Children give hope to thousands of families. We make it possible fochildren to overcome difficult situations and believe in their dreams – and their futures. We discover and share new understanding and information with the world’s medical community. And we share our knowledge and expertise in orthopaedics, burns, spinal cord injury and cleft lip and palate care with physicians and medical professionals around the globe. 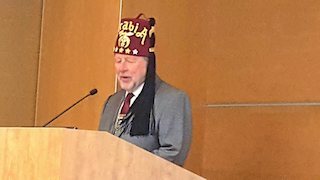 Shriners Hospitals for Children is a unique organization that – in the simplest terms – wants to improve the lives of children wherever and whenever possible. It is no wonder our health care system is respected and revered worldwide. Every one of us should be proud of what our philanthropy has become. With your help and support, we have accomplished a great deal this year. We thank you for all you continue to do for your fraternity and philanthropy, and for the opportunity to work alongside you.